Soft lights and a romantic atmosphere highlight Water Grill, a seafood restaurant in the Gaslamp District of San Diego. We were here to explore the offerings of this restaurant for San Diego Restaurant Week, January 20-27, 2019. As we entered this casual yet upscale restaurant, we were offered seating next to the bar in a comfortable booth. 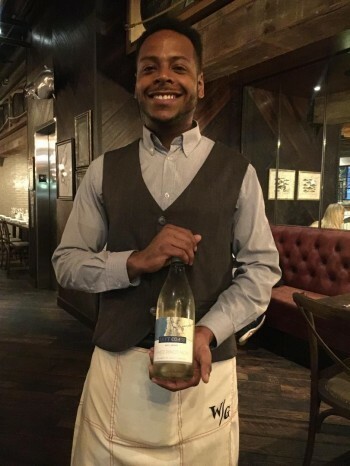 Jordan, our engaging server, made us feel welcomed and delighted us with stories about his upbringing. 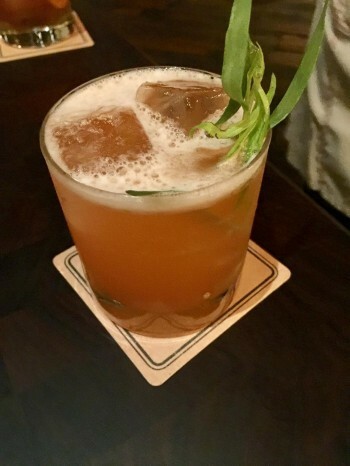 We perused a Restaurant Week menu while we enjoyed our perfectly made cocktails. With a name like Campfire Sling, Linda had to try this drink of Rye Whiskey, maple syrup, dark chocolate bitters, and scorched orange oil. This delightful cocktail was smooth with a slightly smoky flavor. Sue relished the 6th & J Cocktail comprised of vodka, fresh strawberry, and lemon juice with a tarragon essence that added complexity to the drink. From the four first course selections, we sampled the Farmed New Zealand King Salmon Crudo—slices of fresh salmon accompanied by pink grapefruit, dandelion, and pumpernickel—and the Roasted Beets, featuring sliced beets with pickled pears and goat cheese. We also shared a bowl of the Water Grill's famous clam chowder. 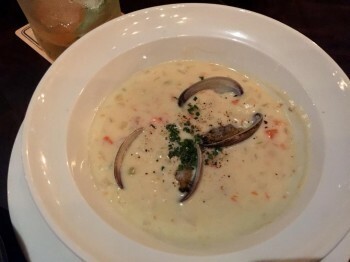 While we enjoyed all three appetizers, we would urge you not to miss the clam chowder. Linda grew up digging clams in Washington State and had an aunt who made amazing clam chowder, making Linda a real clam chowder aficionado. We both thought this was one of the best chowders we had ever tasted. Water Grill offers an extensive wine list, which is bound to include the perfect wine to accompany your dinner. We loved the fact that they offered many wines in a half bottle carafe—just the perfect amount to share after a cocktail. We chose the White Pinot Noir from Left Coast Cellars in the Willamette Valley of Oregon, a wine we have enjoyed in the past that proved to be a great match for our entrées. 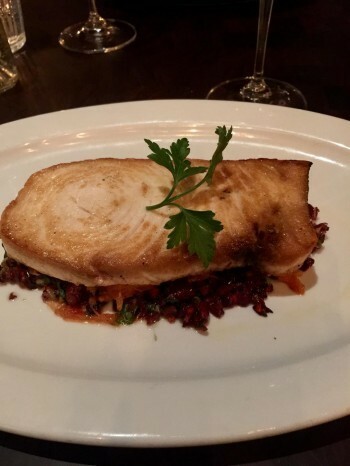 The Restaurant Week menu includes four entrées: salmon, scallops, swordfish, and chicken. One of the entrées we selected was the Wild Eastern Sea Scallops topped with soy brown butter and accompanied by a cauliflower puree. The scallops were cooked to perfection, something that doesn’t always happen with scallops. The flavor combination of the soy butter and scallops was a perfect match. Our other entrée, Wild Pacific Swordfish with Spaghetti Squash, sat atop a delicious olive tapenade that was a salty juxtaposition to the buttery and meaty swordfish (photo to right). San Diego Restaurant Week menus at Water Grill consist of three courses, an appetizer, an entrée, and a dessert. It is always difficult to choose among three wonderful desserts, but in the end we selected the Key Lime Pie with Tangerine Coulis, and the Caramel Bread Pudding with Alsea Red Sea Salt and topped with Salted Caramel Ice Cream. We savored both of these wonderful selections. 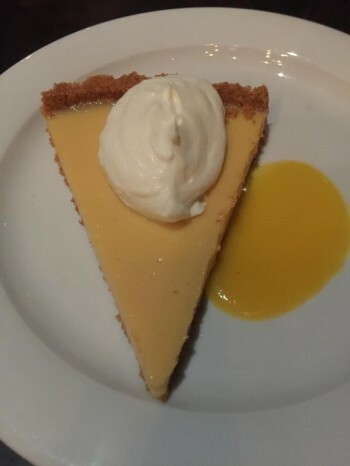 The Key Lime Pie was a perfect consistency with a tasty tartness. The rich and creamy bread pudding made from croissants and brioche kept calling us to finish every last bite. Although the Restaurant Week menu didn’t offer any of the Iced Shellfish Platters with a wide variety of clams, mussels, oysters, and crab, we vowed that on our next visit would have order one of these towering platters, which we admired at nearby tables. Water Grill's gracious manager, Jerry James, gave us a personal tour of the kitchen where we saw live Maine lobsters and spiny lobsters in tanks. 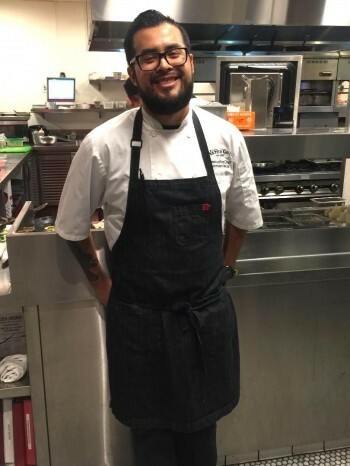 We also met the Executive Chef of this fine establishment, Chef German Mejia (photo to right), trained at Le Cordon Bleu College of Culinary Arts. The San Diego Restaurant Week menu at the Water Grill is available for dinner from January 20-27 at $50.00 per person. We recommend reservations at this popular restaurant online at Water Grill Reservations or by calling 619-717-6992. Water Grill is located at 615 J Street in San Diego. San Diego Restaurant Week is an opportunity to try new restaurants at reduced prices and to fall in love with somewhere you haven’t yet had the chance to enjoy. Check out the entire list of over 180 restaurants at San Diego Restaurant Week.